Description: Morton Street, north end of Bowden Yard on the FEC, 1532 hours. Description: Progress Rail Service genset in FEC's Bowden Yard. Description: PRLX 2009 gets a workout while pulling a bunch of cars off of MC3 in Ridgefield Park, NJ 2/19/2012. This thing sounds like a semi tractor....or a bulldozer. Description: Susquehanna WS-4 with Progress Rail genset locomotive. Description: Progress Rail Genset on the Susquehanna. 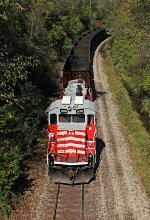 Title: CSX Q410 comes over the Iona trestle! Description: CSX Q410 at Iona Island! 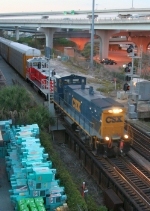 Title: PRLX 2009 on CSX Q410! Description: CSX Q410 has PRLX 3rd out! Title: PRLX 2009 trails on Q410! Description: CSX Q410 has a PRLX PR22B! Description: Worth getting soaked for! Title: PRLX 2009 trails on Q409! Description: CSX Q409 has a PRLX GENSET! 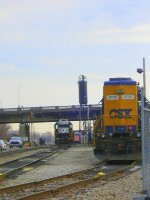 Title: CSX Q409 meets K533 in Blauelt! 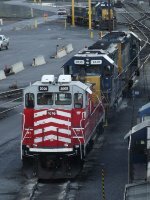 Description: CSX K533 Nwith CP power meets a Q409! Description: Wish I knew this would come back, I wouldn't have stood in the rain last night!